"Don’t drink and drive” is a well-known slogan to prevent driving under the influence. Everybody can recite the slogan even in their sleep, but when having a meal with family, colleagues or customers it’s not easy to refuse drinks as no-one wants to be the party pooper. Also, winter dishes like chicken or duck stewed in rice wine and a shot of liquor to warm up the body may sneakily notch up your alcohol percentage in your blood to the point where driving becomes dangerous for yourself and others. To help people check their alcohol percentage before driving, KINGMAX has developed the Alcohol Check, a smart alcohol concentration detector. The size of a memory stick, this breathalyzer features a MEMS gas sensor and powerful firmware. Insert the breathalyzer into your phone to connect it to the Alcohol Check app. Breathe into the breathalyzer and you will see an instant display of your alcohol percentage, and you can decide whether you should drive or not. If the answer is no, an in-app button enables you to call a driver service or taxi to take you safely home. The KINGMAX Alcohol Check Smart Breathalyzer is the world’s smallest alcohol detection device, measuring only 32 mm in length, 11.5 mm in width. It supports Android 6.0 and is downward compatible with 5.0 / 4.0. No charging required. Plug-and-probe. Fits in any wallet and can be attached to a key ring. When you’re about ready to go home after your meal, simply take out your Alcohol Check, breathe into it for 10 seconds, and your blood’s alcohol concentration will be displayed immediately. An easy way to self-test the alcohol percentage in your blood anytime, anywhere, and avoid drinking too much! Not sure if you’ve had one too many to drive safely? Use Alcohol Check to check it! 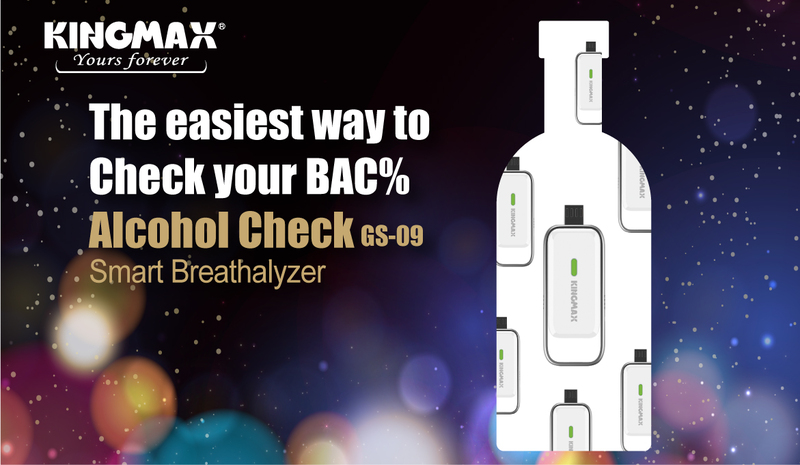 The KINGMAX Alcohol Check Smart Breathalyzer will be rolled out in various countries.